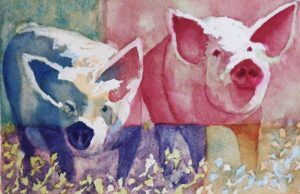 Receive introductory watercolor instruction at Coos Art Museum on Thursday, May 11, 18, 25 & June 1 & 8, 2017 from 10:30 am to 1:30 p.m. Color Your World is a five-day, adults-only watercolor class designed for participants who are new to watercolor or would like a painting skills refresher. Guided by Liv Drahos’ extensive experience in teaching both drawing and watercolor painting, participants will expand their color knowledge and learn to build their personal palette. Exercises are designed to increase your confidence in mixing the perfect colors, placing attention on the focal point of your painting and to easily relate color and value. Plan and create your personal color notebook to document your individual color experiments and discoveries. The fee for the 5-day workshop is $95 for CAM members, $115 for non-members. 6 participants min./12 participants max. Registration ends April 27, 2017. For online registration visit www.coosart.org or contact the Art Education Dept. at (541) 267-3901 or arted@coosart.org.